What is this device and why did it receive the prize? It is a device that will soon be as needed as a trowel when renovating old buildings. Every construction worker knows that it is easier and cheaper to do something from scratch than to repair damaged walls. Unfortunately, something old cannot always be replaced by something new. In the case of monuments, it is impossible. Meanwhile, the cracks and gaps occur mostly in such constructions. To help in filling gaps, engineers invented a special sealing mortar feeder. It is a pressure tank with mortar, operating according to the same principle as a pneumatic paint gun. However, what works great in painting technique is not so good in bricklaying technology. The pressure mortar feeder has several important shortcomings. First of all, its nozzle is often clogged, because even well-sieved sand often contains larger crystals. The container and the elastic tube supplying the mortar have a pressure of up to 10 atmospheres and tubes break when the nozzle is clogged. Another drawback is that the pressure of the mortar at the time of filling the gap can be so high that it bursts the repaired wall from the inside. In addition, this mortar must be fairly thin and a thin mortar is weak. It also requires the addition of plasticizers and this, in turn, increases the cost of refurbishment. Prof. Wójcik has been dealing with the protection of buildings against moisture for decades. He has great scientific achievements in this field, including the Ministry of Infrastructure Award in 2008 for the development of an original method to protect buildings against moisture with paraffin. Because gaps and cracks are the basic route of water penetration, he also dealt with their liquidation. He quickly discovered the shortcomings of the pneumatic mortar feeder. - Some 15 years ago, I started to think very seriously about how to improve it, because the idea is not bad - recalls prof. Wójcik. Through trial-and-error and continuous improvements, he constructed a device that won the prize at the Zagreb fair. The principle of its operation is the same as for existing pressure feeders. 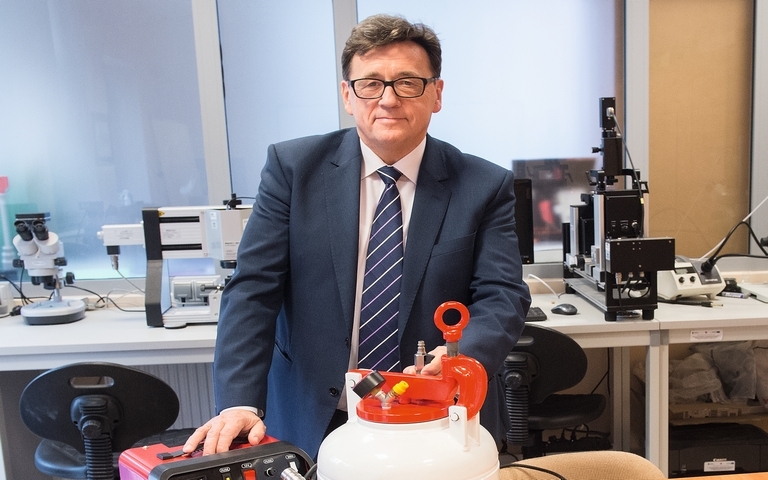 But prof. Wójcik created his device to work under a pressure of 0.5 atmosphere, so it is not in danger of breaking the hose or causing the wall to burst. It is able to pump a fairly dense mortar and does not clog. How did he achieve it? - My idea resulted from the observation: to have the concrete mortar spread well, it must be moved in some space several times by a spade, a shovel or by causing its vibration. Then it will even out and reach all corners. But mortar in a wall gap cannot be moved by anything.... So I adopted the reverse line of thinking: if it is impossible to move the wall or the mortar in the gap, it must be brought there in such a form that it will reach everywhere. So I built a pulsator, which puts the mortar through the hose from the pressure container into the pulsation. It was better than before, but still unsatisfactorily, because the container with the mortar still had to be under high pressure - says prof. Wójcik. After many different attempts, he found a way to reduce pressure. This is a steel string embedded inside the hose where the mortar flows. At regular distances on this string are drops, with a thicker side against the flow of the flowing mortar. This way, 10 atmospheres were no longer required to discharge the mortar from the pressure tank. Only half the pressure is needed. In addition, the mortar, portioned by the drops, flows into the gap and instantly pulsates there. Owing to this, it spreads well even in narrow spaces, and the nozzle at the end of the hose does not clog. But how does prof. Wójcik know that the gap is already completely filled with mortar and that there is no empty space in it which will be penetrated by water and damaged? In the repaired wall, small openings are drilled not far from each other. A metal tube ending with a valve is inserted into them. The mortar is pumped through the lowest hole. When the mortar begins to flow out of the tube, it is a sign to move to the level above. The bottom hole is clogged. He connects the end of the hose to the valve from which the mortar has leaked and refills it with mortar. When the mortar flows out of the valve located above, he repeats the action and thus fills all the gaps. Since the device of prof. Robert Wójcik is small and easy to use, it can be used everywhere. It is simple, easy to wash and maintain and is safe for both the operator and walls.